IT IS WITH MUCH PLEASURE that we introduce another aspect of Nancy’s work: her own photographic works. Few people are aware that Nancy’s involvement in photography went beyond the written word. 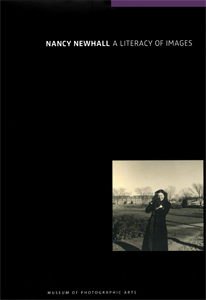 Beaumont Newhall wrote in his introduction in the Nancy Newhall tribute issue of Untitled, published by the Friends of Photography in 1976. The Museum of Photographic Arts (MOPA) in San Diego, under the directorship of Deborah Klochko, presents a major retrospective and companion publication of her photographs and contributions to the history of photography entitled, Nancy Newhall: A Literacy of Images. The exhibition can be viewed on their website at www.mopa.org. The publication will be available by the beginning of December.